The Rainbow Restaurant and Pancake House on Route 31/Main Street in the Fox River Center mall in Algonquin is now open for breakfast and lunch. The diner is bright and cheery even on the grey morning we visited. Decorated in a warm toasty fawn color, the newly remodeled restaurant includes high-end ceramic floor tile with marble counters and matching window sills. A warm muffin right out of the oven started our meal. Plenty of choices on the menu! The extensive breakfast menu includes skillets, omelettes, frittatas, eggs Benedict and more. 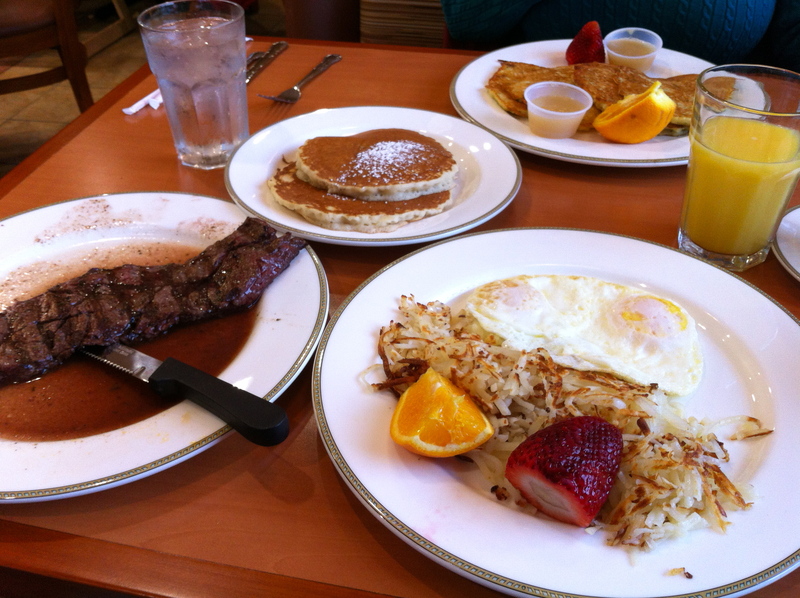 Three full plates brought my husband’s steak and eggs meal; it was so big. My potato pancakes were delicious. Rainbow Restaurant makes them from scratch every day using fresh ingredients. The pancakes are never frozen or prepackaged. This is the case with all the foods at Rainbow Restaurant. John warmly greeted us at the door and seated us promptly. Our server, Jan, was attentive and friendly. Staff topped off our coffee and water glasses regularly while swiftly clearing empty plates. After breakfast, I spoke with owner Nick Dimitrelis. 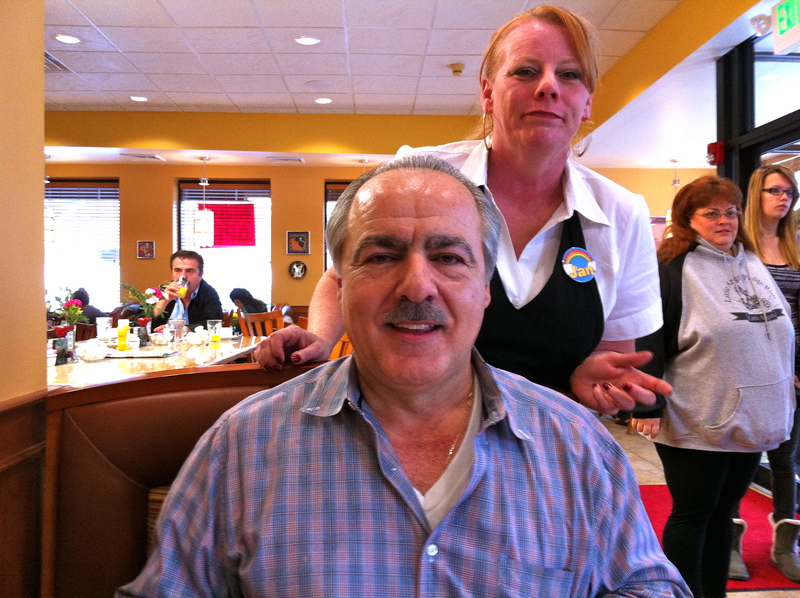 This is his second Rainbow Restaurant; the first opened in Elmhurst 30 years ago. His friendliness and passion for serving high quality and quantities of food came through. 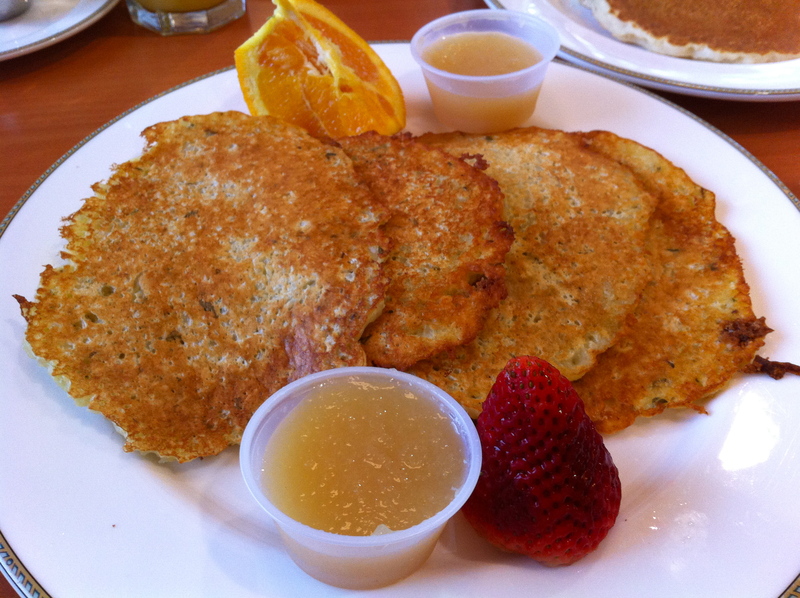 His goal for Rainbow Restaurant is to serve more than just pancake house fare. Every day the Rainbow Restaurant will feature specials starting at 11 AM such as stuffed peppers, meatloaf, BBQ spare ribs, lamb shanks, and baked Greek chicken. Each day the chefs cook two homemade soups from scratch. Two chefs, one helper and a large staff keep the Rainbow Restaurant humming. I counted at least seven servers while we were there. Service was extremely friendly and attentive to our needs. As a vegetarian, I asked about vegetarian options. Nick said at least two vegetarian dishes are on the menu and they are happy to customize orders to meet guest’s wishes. Carry out service is available. Currently, Rainbow Restaurant is open for early breakfast through mid afternoon. The shopping center has plenty of parking stalls.